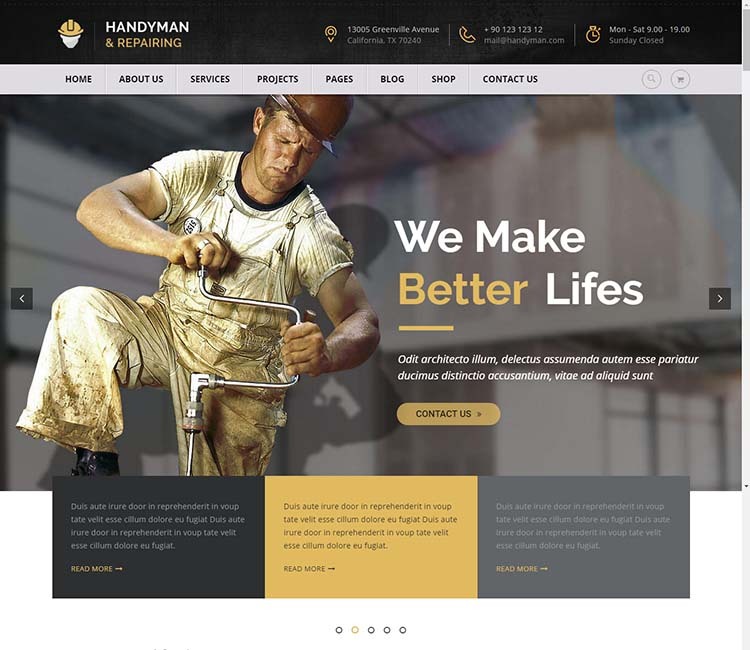 For this roundup, we hammered together a collection of the best WordPress handyman themes for 2019. 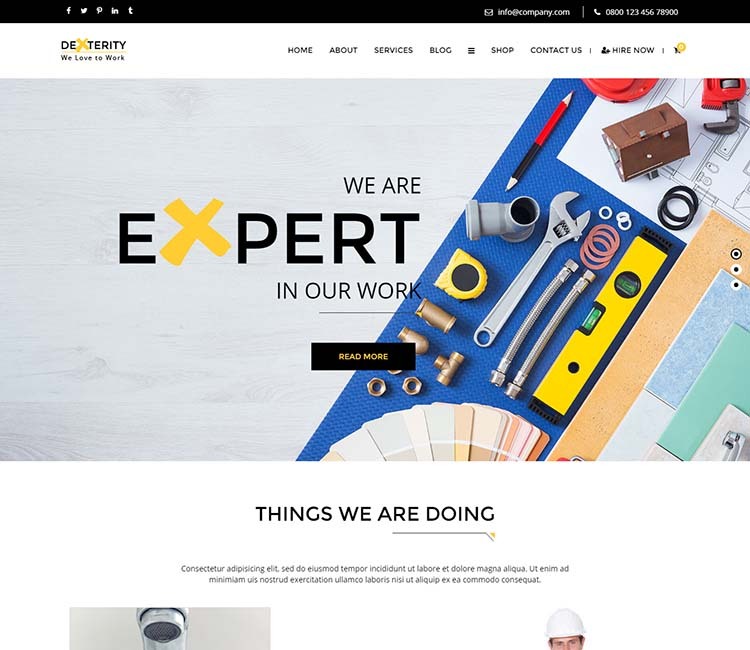 Small businesses specializing in home repair and maintenance will impress potential clients and enjoy an edge over the competition using one of these inexpensive, professionally designed themes when building their WordPress web presence. And these themes aren’t just for handymen. Any theme on our list can easily be adjusted to fit a variety of home and building oriented services. Carpenters, electricians, plumbers, painters, and other repair and renovation professionals should find at least one of these high-quality products useful. We based our choices on design quality, industry appropriateness, and freshness. Everything on this list uses the latest web technologies–responsive design, for example–and reflects contemporary, modern web design trends. You won’t find anything ugly, out-of-date, or barely relevant. On the off chance you don’t find what you’re looking for (hard to imagine! ), you might also want to give our roundup of the best small business themes for WordPress a once over. Before we continue: if you’re trying to save some cash with a DIY WordPress website, be sure not too spend too much on hosting if you don’t expect a high volume of traffic. We recommend Bluehost, one the most reliable and inexpensive hosting providers around (with plans starting at 7.99 including a free domain). Hosting for a small business website shouldn’t cost more than your monthly phone bill. 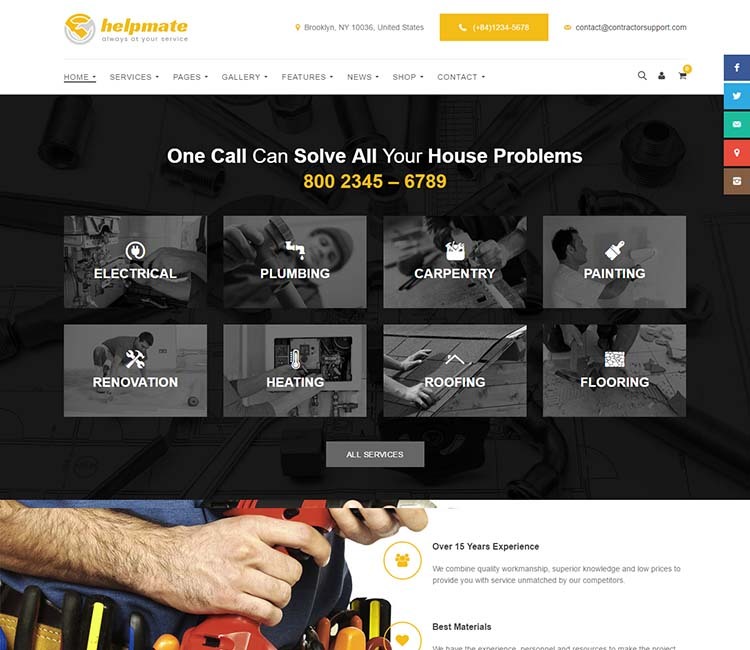 But enough about that, let’s check out some WordPress handyman themes. 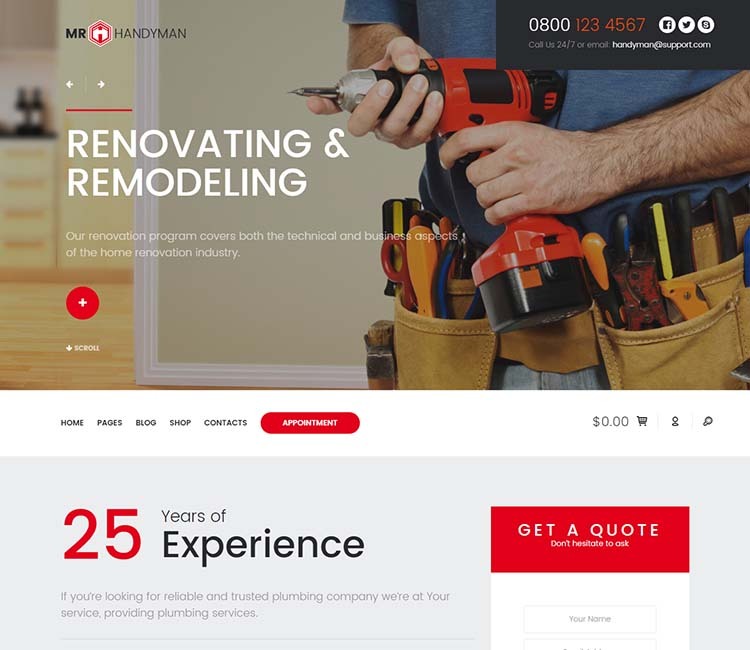 Our favorite handyman WordPress theme is the aptly named Mr. Handyman. It was created especially for small businesses related to home repair, maintenance, renovations, and carpentry. It also works great for building websites for electricians and plumbers. It features four different homepage layouts, and is fully responsive to ensure consistent, great-looking design and UX no matter what device you view it on. The theme is built on the Twitter Bootstrap framework, and powered by the increasingly popular Unyson framework. The theme supports WooCommerce and MailChimp. 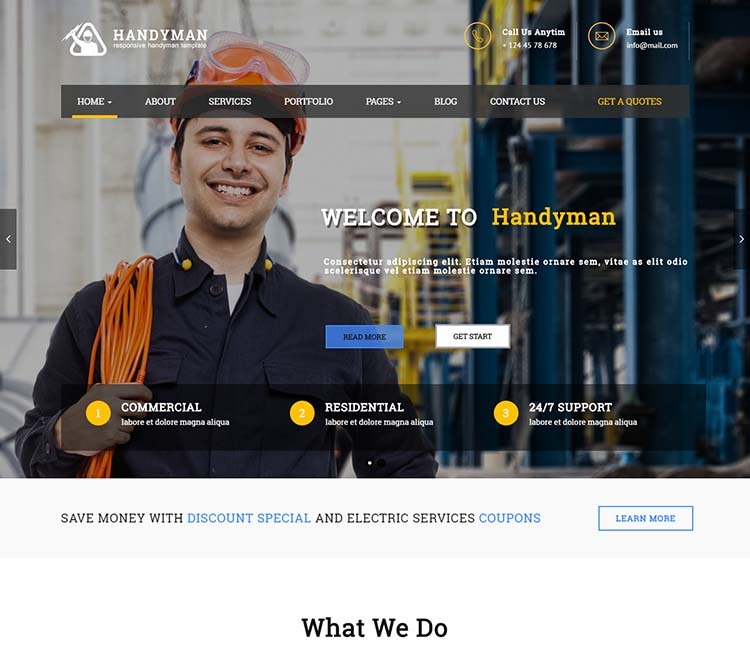 Mr. Handyman is cleanly coded and performance optimized. Translation-ready with RTL support. Next up, we’ve got Dexterity. 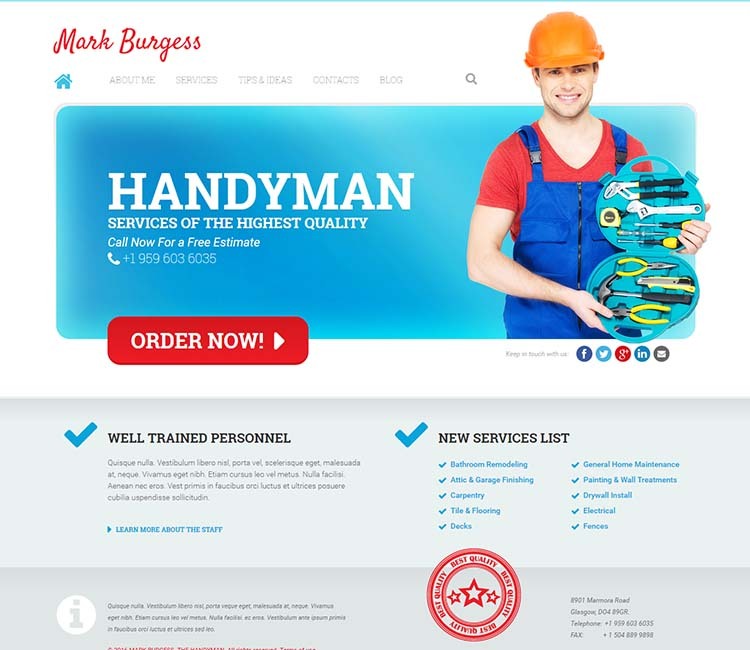 This theme was created for handymen, carpenters, plumbers, and other building and maintenance professionals. It comes with three different homepage designs to choose from. Mega menus are supported, as well as a sticky header feature. Dexterity supports appointment booking, MailChimp (for growing your mailing list), and many options via an admin settings panel. Site owners can take control of fonts, colors, more. The theme is 100% responsive and WPML compatible for translation and multilanguage support. We recommend clicking through to the product page and checking out the demo to get a clearer picture of everything the Dexterity theme has to offer. That brings us to the succinctly titled Handyman theme. There’s no mistaking what this theme is all about. 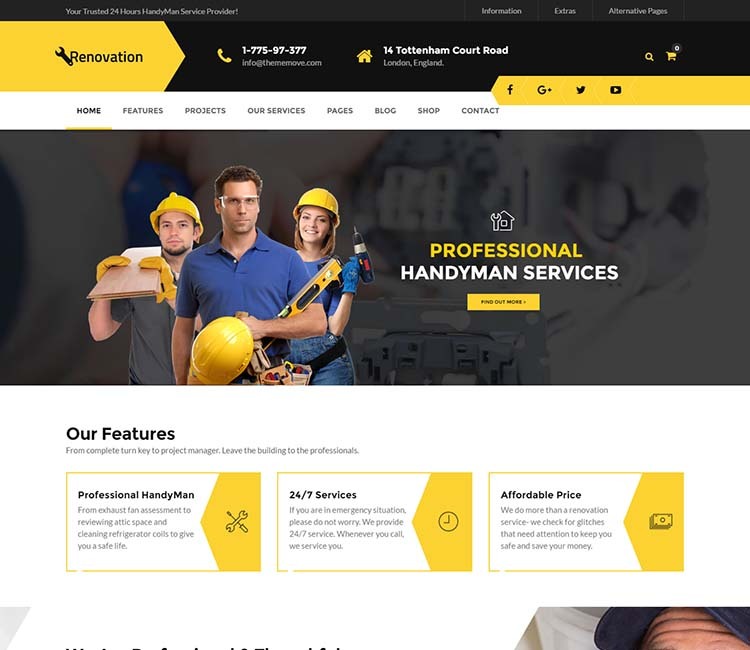 The design is clean, professional, and industry appropriate – it was crafted especially to promote handyman and home repair services. The theme integrates a drag-and-drop page builder, using the MotoPress plugin. It also supports mega menus. Of course, this theme is fully responsive and mobile ready, and works and looks just as good on a 5 inch smart phone as it does on a 27 inch monitor. Helpmate is the biggest and most feature packed theme on our list, bundling six distinct designs, each tailored toward tailored toward a specific maintenance and home repair niche. The theme includes skins for plumbing businesses, gardeners, pool services, moving services, and of course, handymen. A powerful admin panel is baked in, allowing you to manage colors, fonts, backgrounds, logos, and more without having to touch a line of code. Visual Composer is bundled free, for intuitive drag-and-drop layout creation and editing. The theme supports WooCommerce and WPML for its multilingual capabilities. One click installation guarantees a painless, quick set up. The code is SEO friendly. Popular third-party plug-ins Contact Form 7 and MailChimp are also integrated. 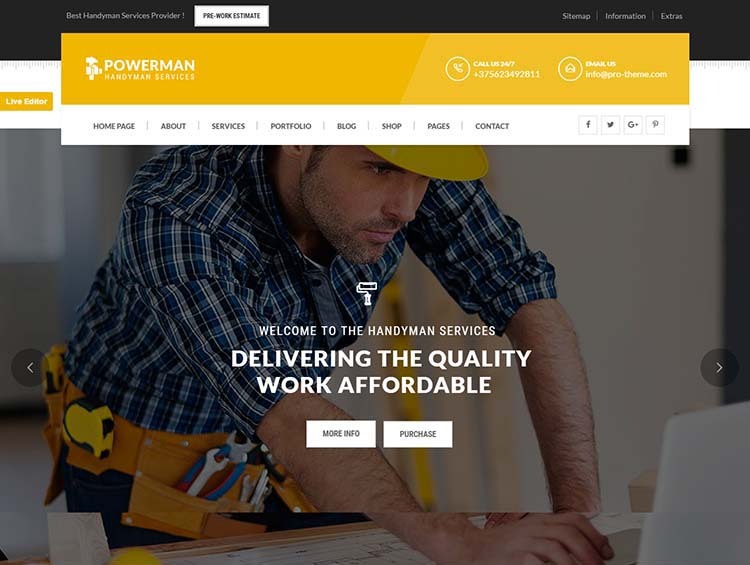 Powerman is another purpose-oriented WordPress theme crafted especially for handyman and home maintenance businesses. The theme includes three homepages and headers, and the developers have bundled in the ubiquitous Visual Composer and Slider Revolution plugins free. Powerman gets it shopping cart functionality via WooCommerce. The theme supports Contact Form 7 for custom web form building, and is easily customized codelessly via Live Customizer. The Maintenance Services theme is a perfect match for individual handymen looking to get their name out there. This is a no-nonsense theme that keeps things simple. The homepage design is bold and colorful, and features a large “order now” button linked to your contact page. It’s a great option for smaller businesses. The theme packs in 80+ shortcodes, color options, font options, and even a filterable portfolio. The clean, carefully crafted code is optimized for search engines, to help you score a top spot in Google. The Renovation theme is a great fit for promoting all sorts of handyman and home repair services: plumbing, painting, drywalling, roofing – you name it. Renovation boasts five homepages, lots of options (including access to 600+ Google fonts), and the code is optimized for speed and search engines. This theme is compatible with WooCommerce, Contact Form 7, and MailChimp. Visual Composer is integrated, for easy page building and layout editing. The testimonials plugin by WooThemes is also packaged. 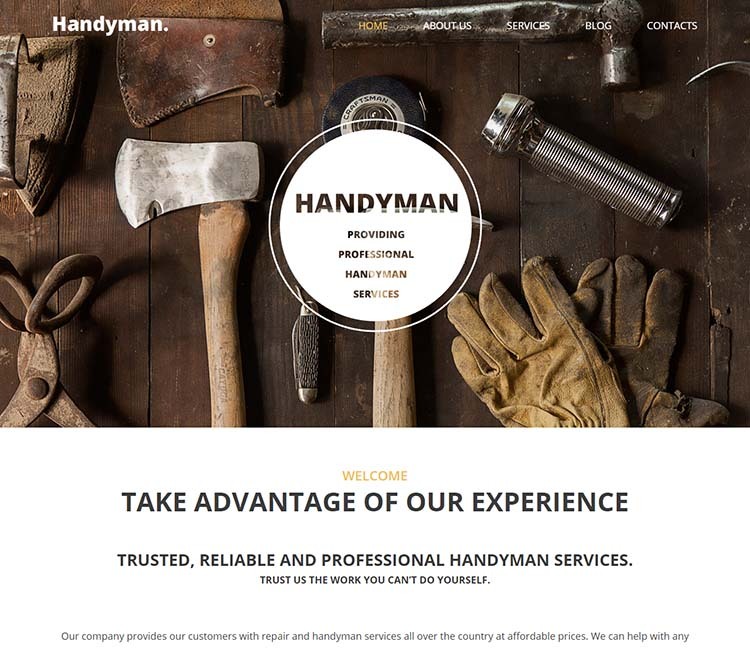 Our next spot goes to another theme simply called Handyman. Built on Twitter Bootstrap, this versatile theme comes with lots of options to adjust and tweak, and the king of page builders, Visual Composer (which powers over 500,000 websites, by the way). You’ll have no problem branding your site and making customizations with this one. Contact Form 7 is integrated, along with Google maps for building your contact page. The included demo content makes installation a breeze. RTL languages are also supported. This may shock you, but Visual Composer and Slider Revolution are packaged. Translation is made easy via WPML. The theme is retina-ready, ensuring crisp graphics on the latest high-resolution displays, and it’s fully mobile-ready for start phones and tablets. The theme is well documented and easy to install using provided demo content.